There was a spider. It thought of making a great wweb tolive in comfortably and thought that there will be caught many insects, flies and I will get them trapped in this, and I will make them my diet and I will be having fun. It got one corner of the room and started to knit it there. After some time web got ready mostly half. Seeing this, the spider was very happy. suddenly it's eyes fell on a cat who was laughing at the sight of the web. The spider got angry and said to the cat, "Why are you laughing?" the cat asked,"why I do not do so?" Don't you see there are no flies here. This place is absolutely clean, who will come here in your nets? "t he cat asked to spider. and spider thought the cat is saying right . She thanked the cat for the good advice and left the web incomplete and started looking for another place. She again looked around and found a window and then began to knit the web for the second time . She was continued in weaving the net, a bird came there and started making fun of the spider "Hey spider, you are so stupid." The bird began to explain to her "Hey, here comes a strong wind from the window. Here you will fly with your webs. " The spider got worried with this , again she left the web incomplete and fly away from there . . Now she was thinking where it should be made and the time had passed a lot, and now he started feeling hungry. then she found a place near the opened door of a cupboard and she began to knit her web there.As she woven the web a little she saw a cockroach which was watching the web with a surprising sight. Spider asked - 'Why are you looking like this? 'cockroach said, "Hey, where are you weaving the web? It is a useless cupboard . Today It is lying here, it will be sold after a few days and all your efforts will be useless. Hearing this, one more time the spider went away from there . Now due to the repeated attempts, she became very tired and she did not have the strength to knit the web again . she was disturbed because of hunger. and eventually she was regretting that it was good to have weaving it beforehand. But now she can not do anything in this tired full situation. When the spider thought that now nothing can happen, she was passing by, she saw a ant on the way and spider was urging to help.Ant said "I have been looking at you for a long time, you start your work and leave it incomplete on other's advice . but always remember those who do this who believe in others more then himself, he has to suffer with this condition." ant said this and went out and left the spider regretting. Friends! many times in our lives, something like this happens. We start work with a great deal of enthusiasm . In the beginning we feel very excited for that work, but due to the people's comments the enthusiasm is decreasing and we leave it in the middle of our work . And when we find that we were very close to our success then there is nothing left except to regret later. 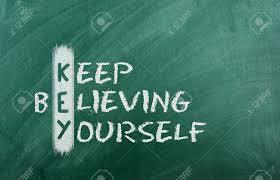 No Comment to " Believe In Yourself ! "